By now you may have heard the news that Couchsurfing is becoming a B (Benefit) Corp, a new type of socially responsible corporation. We’ve been working on this change for the last few months but we couldn’t make any announcements until we knew for sure that it was all going to work. Now, it has and I’m so glad to finally be able to talk with you about it! This transition to a B Corp is a huge change but it’s something I’m very excited about and something I know is going to mean great things for Couchsurfing. The biggest benefit will be the flexibility that B Corp status brings us. It means that we can run much more efficiently and meet the needs of the Couchsurfing community even better. We will have the resources that we need to achieve our vision and mission, and the freedom to innovate. We’ll be able to make even more improvements to the website, ensuring that it’s fun and easy to use. And Couchsurfers can expect to see more great features and tools that will make it even easier to host, surf and connect with the community! Becoming a B Corp doesn’t mean that we’re going to become obsessed with profits. That never has been and will not be our primary focus in the future. In fact, becoming a B Corp means that instead of having just the one bottom line of making a profit, as in the case of a regular corporation, we are required to have multiple bottom lines. We will be accountable to all the people who have a stake in Couchsurfing: our members, volunteers, staff and our investors. To us, our members have always been our priority, but now being a B Corp requires us to make them a priority too — they’re officially recognized as stakeholders. I’m really excited about this change but even so, it wasn’t a decision we came to easily. The rest of the team and I did a lot of research and a lot of soul-searching. We were definitely concerned that not being a non-profit would make it harder to achieve our goal of creating a better world. And, after so many years trying to get 501c3 status we knew we had to find a legal structure that would work for us even better. We’re definitely excited to have you on board for a number of reasons… One of the most interesting things that I learned about CouchSurfing was how well you treat your employees, and that everyone who works there is actually a CouchSurfer themselves. It just seems like a really interesting place and you fit well with the kind of companies we are trying to get to become B Corps. CouchSurfing holds a lot of the same values that we’re trying to instill in companies. After comparing the options, it was clearly the winner. It’s the structure that will allow us the greatest flexibility to achieve our vision in the shortest period of time. It will allow us to provide better features, support and information for our existing members, and reach more and more people. Ultimately, reaching more people is what will help us achieve our vision of creating a better world. So what exactly is a B Corp? I think that’s what we’re trying to do with Couchsurfing, and becoming a B Corp will help us in achieving that vision. Our vision is that our community produce a measurable impact on the world by creating a shift in how people view each other. We want more and more people to explore and connect, and come to appreciate cultural diversity. Becoming a B Corp will allow us to use the power and resources of business to do that on a larger scale. In a way, every Couchsurfer who helps us reach our vision is a social entrepreneur. The B Corporation legal framework bakes your values into the DNA of the company. Like any other organization that wants to become a B Corp, we had to take and pass a B Impact Ratings System test that sets the bar for the social and environmental impact of good companies. Once we passed that we then had to adopt the B Corporation Legal Framework. This is what helps us know we’re keeping the promises we’ve made. Lastly we had to sign a Term Sheet and Declaration of Interdependence where we promise to provide all the necessary documentation to prove that we’re honoring our B Corp requirements. That made our certification official. We needed to develop a set of metrics and standards by which companies could measure themselves against themselves, their respective industries and other companies. We’re really trying to instill best social and environmental practices in companies. One way is through the self awareness of measuring. At the moment we’re scoring over 106.8 which is above average for companies of our size and type. Not only is it really encouraging to hear that we’re already doing a good job, it’s also really inspiring to have a clear idea of where we can improve. The breakdown of our score is available on our profile page on the B Corporation website for anyone who wants to see it, and we will be looking to improve it year after year. We will know which areas we need to proactively work on to become better and better. B Corporation makes it easier to recognize a good company, and to tell the difference between a good company and good marketing. Jay Coen Gilbert, one of the B Lab founders, goes on to explain, “B Corps are redefining success in business.” This is a really interesting statement if you pause and take a look at it. Here are two words, “success,” and “business,” that at least in my home culture in the US are generally used to talk about things like personal prestige and economic gain. Redefining those terms, as Jay suggests, to include the community, the membership, staff, and everyone else affected by a company’s actions can really cause change. It reminds me a lot of the idea behind CouchSurfing. In our community, we believe that every small interaction between human beings adds up to make the world a better place. 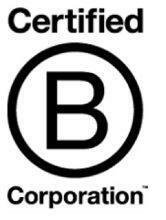 At B Corp, they believe that every company should act just as conscientiously as CouchSurfers do. They want to create a structure that helps all of us that want to do good do even better, and they believe that the effects of this will add up one by one. I really feel that CouchSurfing has found a philosophical home with this movement. There is an interesting TEDx talk where Jay Coen Gilbert discusses what a positive impact B Corps are having on the world, and if you want to learn more about B Lab and and B Corporation I encourage you to take a look at their website. You can see in more detail what it takes to achieve B Corp status, and see some of the other innovative socially responsible companies that have joined so far. I know we’re in good company. It was the day after our exciting night-time adventure at the pyramid and my friend and I were staying on a five-star cruise boat further up the Nile near the city of Luxor. We decided to take a skiff across the river where we found a group of young boys playing soccer and joined them for a game. They may have been younger than we were but they definitely out-played us. Afterwards, we followed one of the boys as he made his way across the desert on his donkey, back to his village. Both my friend and I loved to climb mountains and there was one nearby that we particularly wanted to try. Our new young friend showed us the best way to get up the mountain but was reluctant to go up there himself. We could understand that there was something at the top he didn’t like, but we couldn’t tell what. So, we said good-bye to him, thanking him for all of his help, and set off up the mountain. A little below the summit we found a group of about fifteen teenagers and children. They were dressed in clothes halfway between uniforms and rags, and many of them didn’t have shoes. We couldn’t tell if they were part of the official Egyptian army or some other militia group, but it seemed their instructions were to sit up there and await orders. Hanging out under a tarp with one machine gun between them, they weren’t as intimidating as I think they were supposed to appear. They were cautious at first but we struck up a friendship of sorts despite the language barrier. We shared some bubble-gum with them that we had brought with us from home, and they even let us hold their machine gun. One of the most fascinating things for me was finding nautilus shell fossils up there. I would have loved to know whether findings fossils from the ocean on top of a mountain was fascinating to them too, but I didn’t know how to ask. The panoramic photo below is the view we had from the top. You can see the village where we started our climb below, and the Nile in the distance. When we got back down to the bottom of the mountain we found our friend with the donkey again, and he invited us to eat dinner with his mother and sisters who lived nearby. I was worried that we were going to miss our boat but we decided not to worry about it and stayed anyway. The boy took us to the mud hut they lived in. One of the daughters worked in a larger town about five or six miles away and spoke a little English, but otherwise we got by with gestures and a few words. They had a tiny black and white television with the back missing that sat in the corner of the room. For someone who grew up in the US, this was old technology, but even still it looked strange against a mud wall. I’d never seen old and new contrasted so clearly. I wondered what programs they watched, but again, I wasn’t able to ask. They shared their dinner with us, and gave it to us generously. I wish I could say it was delicious but it was cucumber and bread cut up on the dirt floor, to be dipped in a raw egg from one of the pigeons roosting in the rafters. I was worried I was going to get sick later, because in the US we eat mostly cooked and highly sanitized food. I wasn’t sure my body would be ready for this. But, I really wanted to share the experience — they were so generous to share their food with us when they had so little for themselves. We ate and sat and chatted with them as best we could manage. The mother told us how difficult it was raising four children without a father. That much we could understand, although we couldn’t work out what happened to him. Only two of the daughters worked and what they earned had to provide for the whole family. Even they had to travel seven or eight kilometers across the Nile to get to their jobs. Despite not have a man’s income it didn’t seem as though they were any worse off than their neighbors, and they seemed to be a very happy family. By the time we had finished our evening of food and conversation we had already missed our boat home so they invited us to stay the night. Because they all had to live together in the two-room hut, there wasn’t enough room for us inside and probably, by local customs, it wouldn’t have been appropriate. They gave us blankets and tried to make us comfortable on benches of dried tree branches that were about two thirds the length of my body. Needless to say, I didn’t sleep very well, but I didn’t care. I smiled up at the full moon, thankful for such an experience, and hoped for many more moments like it. At 6 A.M. the next morning one of the daughters who worked in town across the Nile let us walk with her on her commute so that we wouldn’t lose our way. Our tour group was moving on to another town that morning and we knew we would not have much time to spare before they left. We bought her breakfast and stopped in to see where she worked before rushing to rejoin our group. For the rest of my trip and my journey home my head was filled with one thought: “How can I keep doing this?” My experience with both the families of the taxi driver and the boy with the donkey had opened my eyes to a new way of traveling. I had gone to Egypt seeking something interesting. I hadn’t even been sure what. I had wanted adventure, but it was the first time I had ever traveled outside of North America, and I was nervous. I hadn’t known if people could be trusted, but the people I met there had taught me what I thought to be true but had never really articulated. That people are naturally curious and kind, and that they are as interested in meeting me as I am in meeting them. I had shared with them as much as I could about my own culture and it had been received with warmth and enthusiasm. It would be a few years and many more adventures before I started to get a clear picture in my head of what CouchSurfing would look like, but at the end of my time in Egypt, I knew this: I owed my adventure to the people I’d met. Interacting with real, everyday people had made what could have been just a vacation into something inspiring and life-changing. I decided right then that I would always make it my mission to find real, personal interactions with the people of the places I visited. In my last blog post on the Couchsurfing vision, I touched on the story of a trip I took to Egypt back in the spring of 1998. I’d like to tell you more of that story now, as I think it’s a great example of how one experience might just change the course of your life. Tourism is an important part of the Egyptian economy but after a deadly attack on tourists in late 1997, it was at a serious low. Tour packages from the US were going for a fifth the normal price. I found a group that was traveling to Egypt to show support for the country in this tough economic period. I’d never been to Africa before and I wasn’t going to find a more affordable trip. With instructions from my friends and family to be careful, I boarded a plane from JFK airport, New York to Cairo. One thousand dollars bought airfare and a two-week stay in luxury resorts in both Giza and Luxor. It also included time aboard a Nile cruise boat and daily excursions to famous sites. As grateful as I was for the opportunity and for the people in my group, I wanted something different. As fate would have it my roommate was a young man from Texas who, like me, was eager to have a more inspiring experience. Together we would sneak away from our tour group and do our own thing, only rejoining them in time to make it back to the hotel. He was of Iranian descent and looked as though he could be Egyptian. This made it much easier for us to go to the places we wanted. He just had to keep quiet and not let slip his thick Texan drawl. Normally, the tourist sites would be completely crowded, but while we were there it was a ghost town. This meant we really got to connect with the people who worked there. They had little to do so were happy to talk to us. They even offered us tea while we sat and chatted about what our different lives were like, and how difficult life had become for them since the drop in the economy. Our first evening we shared a beer with a taxi driver. 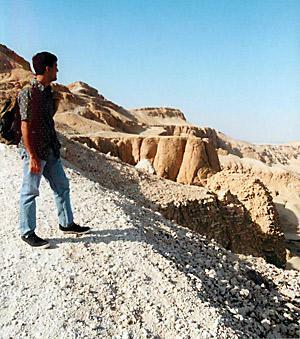 In part because of the courage it gave us, we were able to persuade him to help us see the pyramids. I mean really see them. They’re so iconic and full of legend, and I wanted to truly experience them. After a while he gave us the name of a boy whose father was a high ranking guard, and was known to show people around from time to time. We didn’t find the boy very easily, but the taxi driver was happy to drive us around for hours, playing tour guide, until one of the people we asked said they had seen him. Once we found him he agreed to be our guide and told us to meet him at 4 A.M. the next morning. With quite a few hours to kill before our early morning adventure, we spent our time roaming the town on the edge of the desert, under a full moon, and driving around with the taxi driver. He invited us to attend a wedding celebration and eagerly acted as translator as we spent the night talking and smoking hookahs with the old men of the wedding party. When we told them we were going to try and see a pyramid, one of them even gave us some chakra oil to put on special energy points on our body while we were there. Early the next morning we met our guide in a neighborhood near the pyramids. We had no idea if we could trust him to keep his word, or whether as young tourists, we were an easy target for a scam. My intuition told me that it was worth taking the chance, and that I could trust him even though he was a stranger. The moon was bright that night. We crawled over a pile of garbage, and a part of the wall our guide knew to be broken, to reach the plateau where the pyramids stood. He led us through the grounds around the eastern side of the pyramid. I could see the hole in the ground where they had excavated the boats that had been discovered with ultrasound a couple of years previously. I remembered the photos I had seen in National Geographic, and I couldn’t believe that I was actually there. Our guide introduced us to some of the guards and we sat and talked with them for a while. Eventually, after checking out some more of the grounds we had to leave to get back for a 6 A.M. sunrise meditation with our tour group. The group was taken to a large, flat rock about twenty minutes bus ride away, where there was a view of the sun rising behind the pyramids in the distance. I felt really thankful that I had taken a chance and gone out exploring the night before. Because we had trusted the people we met, our night time adventure included a closer look at the pyramids and and lots of fun moments with local people. As exciting as this time had been, it didn’t end there. Later, my group left Giza and moved onto Luxor. Check back for my next post where I’ll be sharing the story of my time with the people of Luxor, and how they helped make my trip so special. The mission statement came from the heart, but it wasn’t all that useful. It captured the feeling of what we were trying to create, but it didn’t help us know what exactly we should be spending our time on. We liked it a lot, it’s on our website even now, but it still didn’t really help guide us enough. It was a slogan that was useful in attracting people, but it didn’t help us in knowing what to do and what not to do. People had their own ideas of what should be a priority and what shouldn’t, and it could be argued that almost everything would fit into the mission in some way. This meant that people were taking lots of little steps in lots of different directions. What we wanted was to take big, coordinated steps towards helping Couchsurfing achieve something greater. The founders started researching what a mission statement was exactly. We read a lot of books and online texts on how to create one. What we found was that there were really two different concepts: a vision statement and a mission statement. It seemed that more sophisticated organizations had both. The vision statement should be what we wanted the world to look like and the mission statement was how we were going to get there. We started distinguishing between the two and that helped us move towards finding our compass. We decided that what we really needed was input from our members, so we examined the mission statements on their profiles and what was being said in the testimonials. From that we created word clouds. We were so excited, because we realized it was Couchsurfing that enabled this chain to happen. During the Thai collective we wrote the first draft of the vision and mission statements as you see them on the site now. We took them to twenty or so people of varying backgrounds and got back lots of changes and recommendations. We repeated this until we got back fewer and fewer changes. Then, we took them to about a thousand members and non-members, until we got to where 90% of people agreed with both statements. We were really surprised that the number was that high and knew this meant that the statements were probably as good as we could possibly get them. We shared them with the community on the website in 2009 and since then they have helped us determine what we should be doing and what we shouldn’t. Knowing our long-term vision has helped a lot – it has helped us agree upon where we’re going and it has provided a framework for us to work within. We always knew we wanted to create a better world. Now we knew exactly how Couchsurfing could contribute. 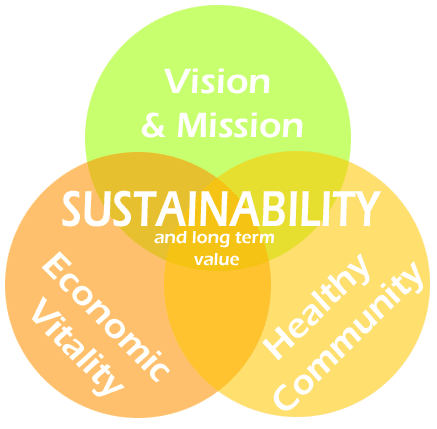 So how do the vision and mission statements relate to what we do every day? Well, our vision statement is the goal we’re aiming for. It’s how we want the world to look — an understanding world where people respect and appreciate each other’s differences. Our mission is what we’re doing as an organization to get to the vision. We have a list of different goals that help us move towards that mission. We also have a list of projects that help us move towards each one of these goals. And, we have a list of tasks associated with those projects. These tasks are what we do every day. Our mission statement is something that we can change if we ever discover a better way to accomplish our goals. The vision (which is the statement of those goals) should never change. If you haven’t already, I hope you take the time to read the Couchsurfing vision and mission statements. I’d love to hear what you think about them. How much of our time do we spend thinking about the right way to do things, either under the assumption that we’re wrong, or that everyone else is wrong? I’d like to ask you, is there one right way? Or, are there many right ways? Obviously, there are a limited number of ways to put on pants, if pants are what you choose to wear. And, if the country you’re in says you must drive on the right side of the road, then in that instance the right must be right. But, when it comes to living your life, who’s to say? One summer, back in ‘98, I was on a two month road trip with a friend, driving through the southern United States, and up the coast of northern California into Canada. 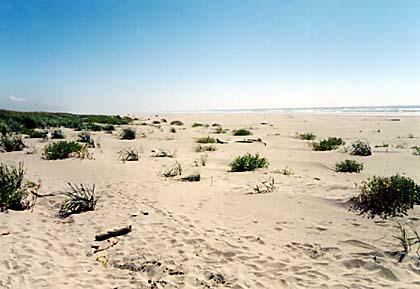 At one point, as we drove through northern California we stopped at an unmarked beach to take a walk on the sand. The sun was blazing hot and the dark sand in the dunes was almost unbearable to walk on. But, the water was far from blue and inviting. It was the color of steel and the waves were fast and strong, and because the beach was short the waves could catch you by surprise and soak your shorts. I walked about half a mile, just thinking and taking in the beauty. There were hundreds of birds flying around, and down the beach I could see a group of about thirty sandpipers dancing back and forth. They were scurrying in to peck at the freshly washed sand and rushing back to get out of the way of the next incoming wave. I watched them for a minute thinking, “Wow these waves are really coming in, I wonder if they feel like it’s dangerous.” I felt like I could get swallowed up at any second. I watched a bit longer and pondered their movements. I wondered if their whole dance was completely random or if they all held their positions within the moving flock. To me, it looked as if some of them were risk-takers while others were timid. As I watched it became very clear. It wasn’t random. There were a few that skirted the very edge of the water, a few that stayed far away from all the action, and the majority bunched together somewhere in the middle. 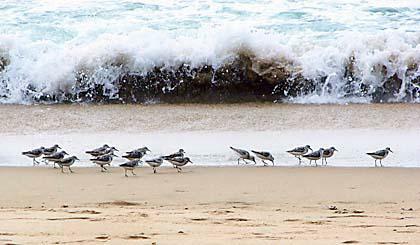 I thought about what it would be like to be one of the sandpipers close to the waves. Would I think, “Why aren’t you all up here in the waves with me, where there’s more food to be had?” Maybe being close to the waves like that was risky and some of the birds would get swept away. And, maybe it was better for the entire flock if some of the birds are more cautious and stayed a bit farther from the waves. I guessed that the flock had a better chance of long term survival if each bird had a different role to play. In times of calmer waves, the ones near the ocean would thrive. In more dangerous and tumultuous times, the timid ones would ensure survival of the group. I guessed it wouldn’t work well if any of them, after watching other sandpipers, thought there might be an advantage to behaving differently. They needed to feel as though their position was intuitively right. I had noticed that the flock was roughly arranged in the shape of a bell curve. After contemplating them for a while I began to wonder how much the different areas of my life could be depicted on a bell curve. Was I in the middle of the pack on some political thoughts, but closer to the edge of the group when it came to fashion, for example? The thought also dawned on me that I must spend a lot of my time feeling as though my way is the right way — how often did I look at other people and wonder why they were not doing things the same as me, and judging them for doing them differently? I became fascinated with my own, low-level assumption that my way was somehow the best way. This assumption pervaded my thoughts, and I realized that I spent a lot of time looking for ways other people were doing things wrong; finding evidence to support my own story. Nature wants all the different kinds of sandpipers — timid, brave and all those in between — to exist together. If each of the birds didn’t think what they were doing was right, and started doing something different, it might upset the balance of the flock. So what does this mean for our species? I think it wants nature wants diversity for us too. I think it’s extremely important for the survival of our species to move towards diversity because the more diverse we are, the more opportunities we have. There was a time in our evolution that it was necessary for our survival to reject what was different. But, now we’re at a point where that important defence mechanism is less necessary. We’ve evolved to deal with threats to our safety, and are secure enough in the continuance of our species that we’re able to appreciate people’s differences and recognize that everyone has a part to play. I think the problems that we will face in our future will be better solved if we can understand and appreciate our differences. The experience with the sandpipers was very influential for me. After leaving the beach, I continued to wonder how much time we all spend thinking about the right way to be, and I still think about it now. I decided that I was going to try and be thankful for all the differences that people have, and recognize that those differences can lead to a better world. I was going to try and be open-minded and curious. I noticed, however, that it was easier for me to be more open-minded the further from home I traveled. In Egypt and Iceland I was curious about and receptive to the people and the culture, but it has been my experience that in your own back yard that can easily fall away. I found it was easy to revert to a more critical and less understanding way of being. I want to keep traveling and exploring the world with an open mind, but I realize that that learning to appreciate diversity will be a lifelong endeavor. What are your thoughts on diversity? Do you agree that it’s important for the survival and evolution of our species that we cultivate our differences, or do you think it’s our destiny to become more and more alike, or something else? When you travel, do you strive to keep an open mind about your hosts and the other people you meet? How easy is it to do that? How about when you’re at home or somewhere familiar? Do you approach people with the same respectful curiosity or do you find it more difficult? I am fascinated by this topic and think it a valuable debate for Couchsurfing members to have.